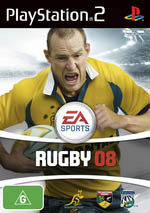 The most definitive Rugby games on PlayStation 2 and PC in EA Sport's Rugby 08 which allows player to experience the 2007 Rugby World Cup in France. 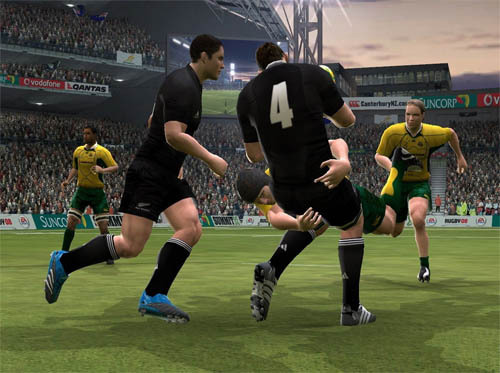 Although gamers can play a variety of different gameplay modes, the holy grail of the title is winning the Webb Ellis Cup which allows player to live their ultimate Rugby fantasy. Own the World: Power your way through a grueling six-week campaign during Rugby World Cup 2007 in France. Manage squad rotation and player injuries and track the progress of the entire tournament with a user-friendly, in-game information hub. Authentic Defensive Formations: Now you can emulate the style of your favorite team with Authentic Defensive Formations. Adjust your defense on the fly to keep momentum on your side. Counter your opponent’s attacking style by changing your defensive strategy based on score, field position, and more. Rugby World Cup Challenge: Replay over 30 classic moments in Rugby World Cup history using modern teams and unlock exclusive Rugby World Cup highlight videos. All New Set Pieces –Take full command over every scrum and maul with enhanced push and rotation controls. Make lineout throw-ins look easy with a simplified pick-up-and-play control system for the novice player, or master the advanced mechanics to enhance your game strategy for the real pro. New Kicking Mechanic: Use the new kicking meter to master your drop kicks and score those key penalties and converts. The title also contains the official Rugby teams so players will be pleased to know that their favourites are included in this title with 20 national teams. The developers have also ensured that the gamer is rewarded for their efforts as they can not only replay historic matches but they can also unlock Rugby World Cup highlights. 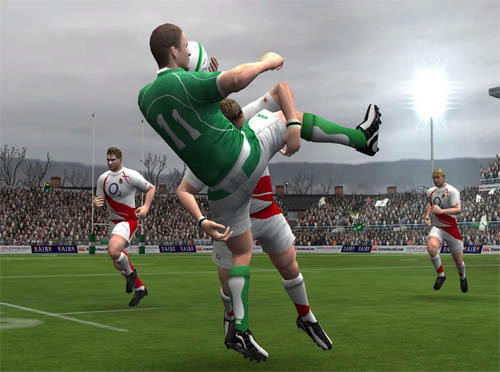 EA have also rewritten the control systems of Rugby 08 that now introduces a layered pick-up-and-play control system for set pieces and drop kicks. How does this work in practice? Quite well actually as the game gives you even more control than previous versions, although the AI can still be a challenge. The Sony DualShock controller works like a charm on Rugby 08, especially how the player can now control the scrums and the amount of force your players will use. Experiences gamers will have no trouble in mastering the control system, however some inexperienced gamers may need a little more time in becoming familiar with the controls. For those sticklers on accuracy, Rugby 08 features a plethora of defensive and offensive manoeuvres that allow you customize how your team will play against their opponents. Graphically, Rugby 08 is a visual treat on the PlayStation 2 and proves that this old dinosaur of a console still has a few years left in it. The player models are extremely realistic with detailed facial features. Match that with realistic movements and some great dynamics and it's almost like you are watching the Rugby on television. The stadiums are also quite detailed and replicate their real-world counterparts that is filled with thousands of fans to truly immerse you into the Rugby World Cup of 2007. You can also zoom into the action of the matches too with new and improved camera angles. 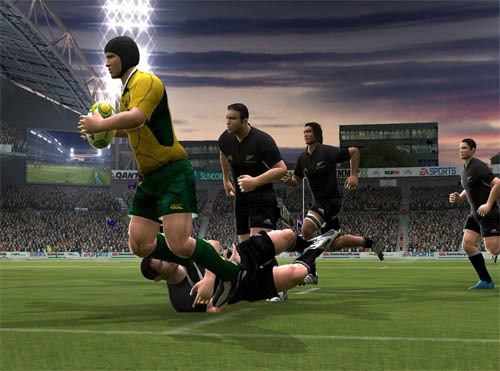 As with the graphics, the sound effects of Rugby 08 are quite realistic, although it would be quite difficult to mess the sound of this game, considering they are basically just grunts, shoves and the roar of the crowd. Once again EA provides a great soundtrack to the title that really makes use the menu systems and adds to the excitement of the title. In conclusion, Rugby 08 will probably be the last Rugby game for the PS2 and EA have a real winner on their hands with almost perfect gameplay, realistic player animations and title that can be played over and over again. Play it hard!